First, I get an invitation to an exclusive shopping night next week at J.Crew in Toronto. Exciting, right? Well, yes, except I just got back from Europe and did what one does there — spend $$$. But now this: I take a quick peek at the web site to do a little pre-event reconnaissance. You know, just in case. Now I know there is a secret plot in the creative director's office (I'm looking at you, Jenna), to absolutely murder my bank account. They might as well have called the new Collection the Margot Collection. First there are those pumps above. Black Watch + Mary Jane strap + ladylike heel. Yes, yes and heck yes. These Collection Avery Embellished Heels in Tartan hit a few perfection notes: they are Stewart Black Tartan (the better of the Stewart tartans), they have pointy toes (so good for a petite girl such as moi), they have block heels (a heel not so unreasonably high that a person who works at home could still wear and not feel like an idiot walking around their house in high heels), they have a buckle (I can take or leave the sparkle, but love me a buckle-on-a-bow). Lone downside: price, $378. Just a hair out of my snack bracket. Colette Bow Pumps in Stewart Plaid. 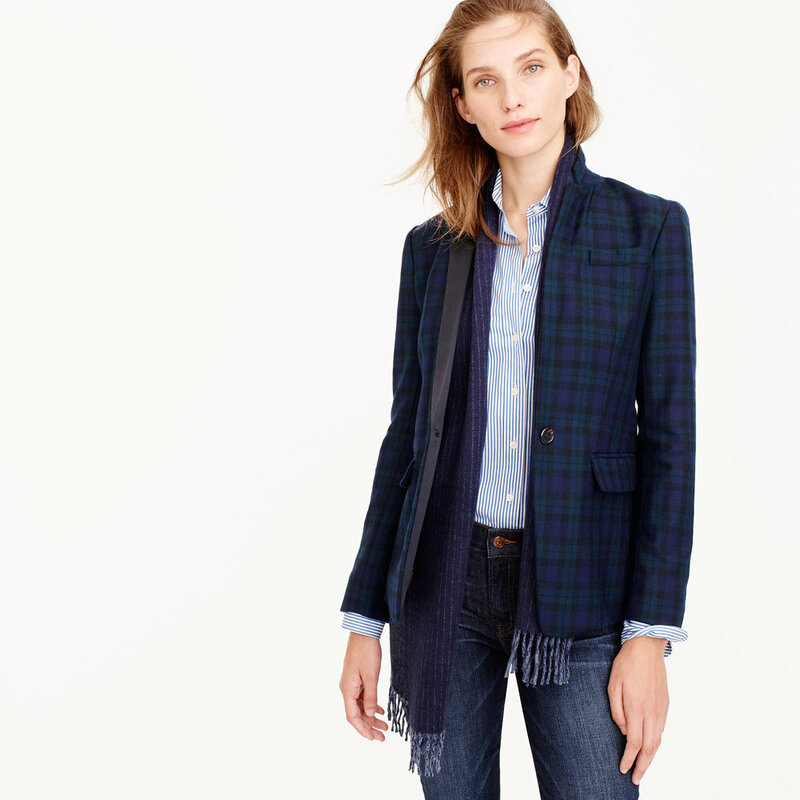 Oh for Pete's sake J.Crew. You are KILLING me. Again with the Stewart Black Tartan, again with the ladylike heel but also with shiny festive bows? Come oooooon. $353. So I click away from the shoe department to catch my breath and then find these, Cropped Maddie Pant in Black Watch Bi-Stretch Wool, $182. Here's the thing: I already own a pair of slim stopped Black Watch trousers (natch). Oh myyyyy, this is a tartan trench. This is a thing I do not need. This is a thing I want. And I would wear it just like this — with my jeans a Breton stripe. and everywhere, and maybe as a bathrobe. $474. And for the coup de grâce we have this: Regent Blazer in Black Watch with Satin Lapel, $259. Click on those pics above to see it in more detail. The satin lapel is a masterstroke, but so is that pin dot lining and bright blue trim. You know they call that inside stuff the "interior design" of the garment. Thanks for that J.Crew. My bank account may only be saved from this by two possibilities: 1. It may not be in store yet at the time of the special shopping event I'm going to, since it is only avail. for preorder now (and no, I'm not going back or ordering online). and 2. It probs won't fit since the J.Crew fit squad has a general disdain for breasts. As in, they don't make room for them in their garments. I have fallen for the trick before. I see a blazer I love. I try it on. It fits perfect in the shoulders, sleeves are a little long (but can be hammed or rolled), but then I can't do it up over my ladies. I decide I'll get it anyway and just wear it open. WRONG. Nothing makes you feel more craptastic about yourself than ill-fitting clothes. Oh, one thing does: seeing yourself in a photo/on TV wearing the ill-fitting clothes. Won't fall for that again. Tartan-lovers unite and get thee to the Crew.